We all have those spots in our homes. You know the sort… those neglected areas that you plan to get to some day. They often get relegated the leftover furniture that had nowhere else to go, yet you still want to make them look pretty until you can really do what you want with the space. Welcome to our temporary fix for the upstairs hall. We have a reasonably spacious hallway between our bedrooms, but that was not the case in our old home, so I really had nothing specific planned for this new space or special pieces that were perfect for the spot. With a whole house to decorate when we moved in less than a year ago, this wasn’t exactly at the top of my list. I had a marble topped bombe chest that I got at an antique market years ago. It’s a pretty little piece that’s not in great shape and from a scaling standpoint it’s quite tiny for the area. Still, as a temporary anchor we slipped it into place. 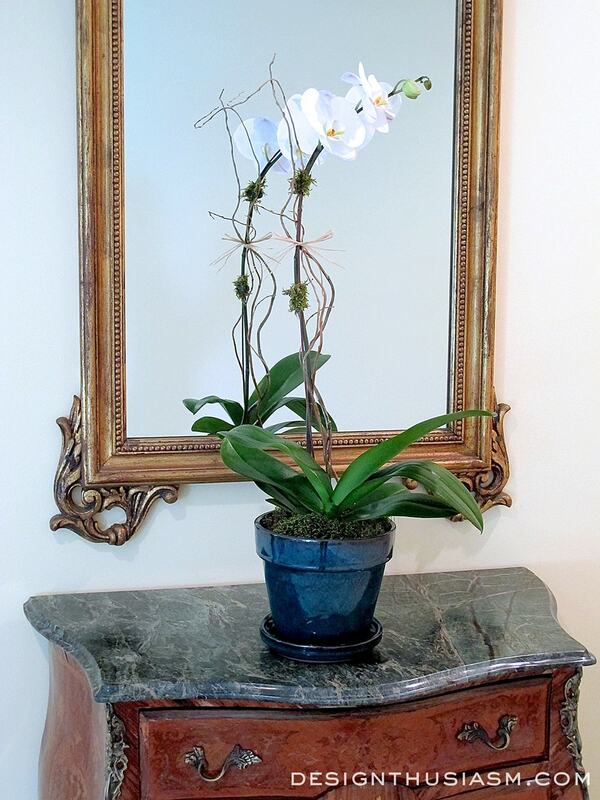 Because of the limited width of the piece, I wasn’t particularly inspired to arrange a vignette, but then serendipity stepped in and we were gifted with this gorgeous orchid. 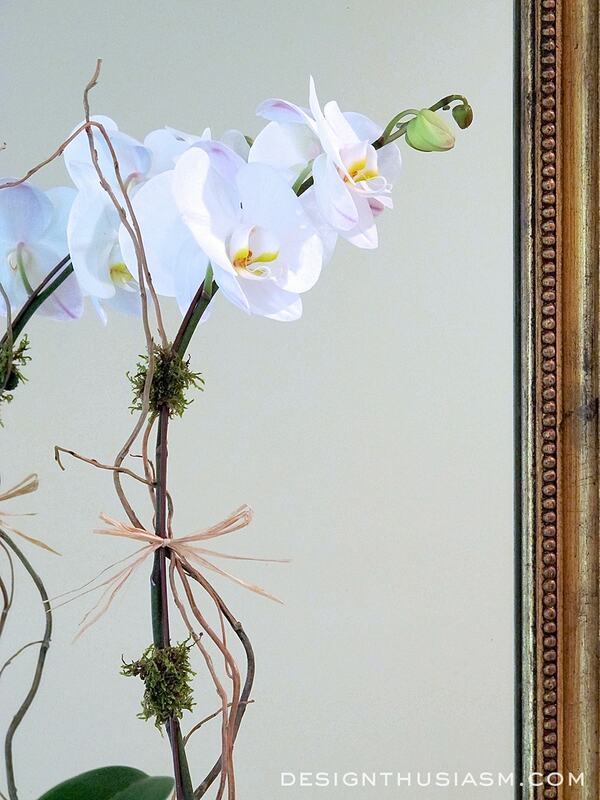 As much as I love lush floral arrangements and layered vignettes, there’s something refreshing about a single orchid sitting regally front and center on an apt sized tabletop. If there’s one thing we had a surplus of it was plenty of gilded mirrors and this one is well suited for the space, if not for the tiny chest beneath it. The proportions are all off and it’s a temporary fix to be sure, but it hints at the beginnings of the look I hope to build on later. I think it warrants a wider chest or console, but I love that it reflects the light that comes in from a nearby tall window. 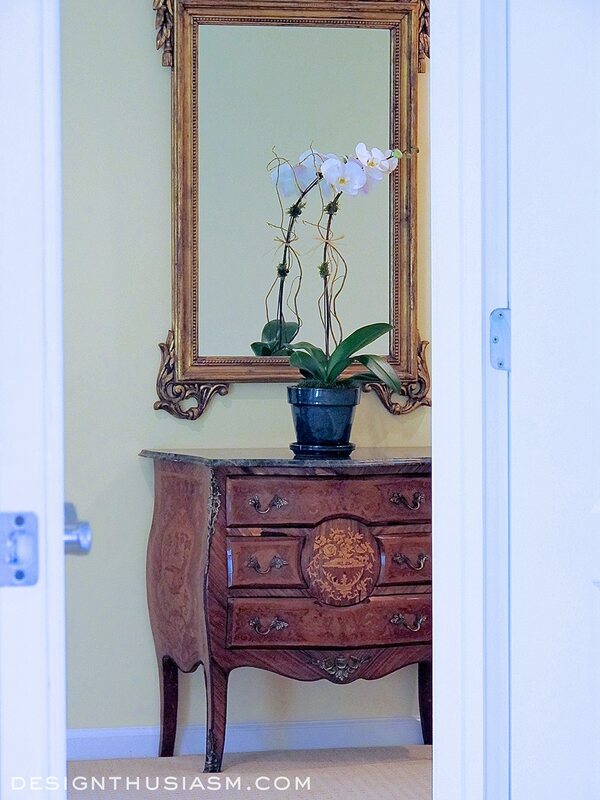 It also beautifully reflects the simplicity and elegance of the lone orchid, a cheery sight to behold when I leave the bedroom in the morning or return to it at night. You can kind of get a peek down the adjoining hall to the laundry room, but the larger part of the hallway is in front of this piece, at one point overlooking a railing toward the front entrance. There’s potential here but thus far we haven’t conquered it. As the wall is angled, the mirror also faces a second window presiding over the staircase landing, an area I revealed in my first post after we moved, Creating a Charming Stairway Nook. Thanks, Shirley!! Ha ha, yes, I agree about surfaces. That’s why I want a longer table here… 😉 When we first moved here last spring, I decide I wanted to have a more streamlined look with simpler arrangements, but lately I’ve been feeling like going back to my old ways! That is gorgeous! Love the table!! Very pretty! I love orchids so much but struggle to keep them going. Some day I need to read a book on how to do it. I don’t have an upstairs right now but when I did I put a vintage dresser that held all of our spare sheets ( a drawer for each bedroom) and a painting above it. 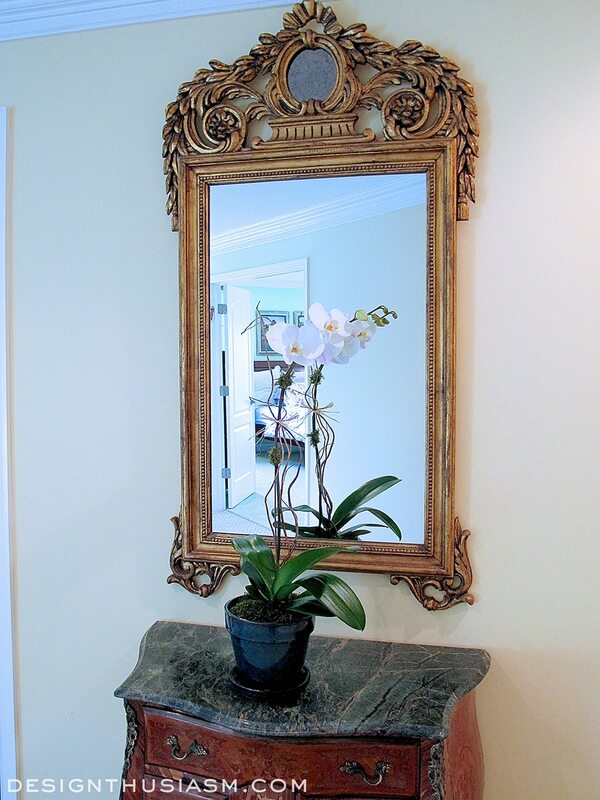 I love this vintage mirror and wouldn’t move it…it’s perfect. Lory, even if this is a temporary fix, it’s a beautiful one. Although the bombe chest is lovely for sure, it is a tad small in comparison to the mirror. Because you already have seating with the two French chairs on the first landing, I’d stick with a table in this hallway area–always nice to have a surface, especially as you always have such lovely decor pieces for the finishing touches. Thanks, Bobbi! And it gives me a reason to look for a new piece… 😉 Just not yet! Such a pretty chest – always enjoy your post Lory! This looks amazing, dear friend! I’m intrigued to see what you will change within the space! Thanks, Pat! I’m intrigued took… 😉 Haven’t planned it yet! I love it for its simplicity. 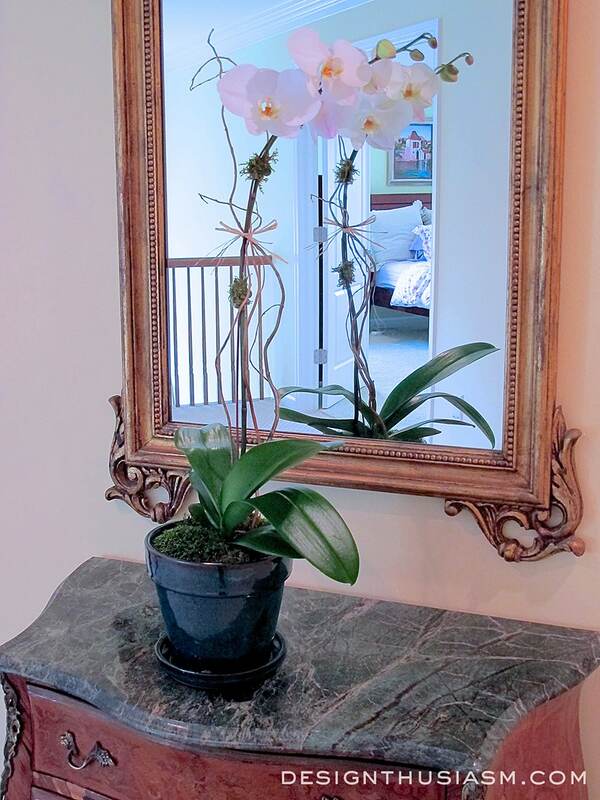 When you have an orchid on display you don’t need anything else. From the photo it looks very nice. 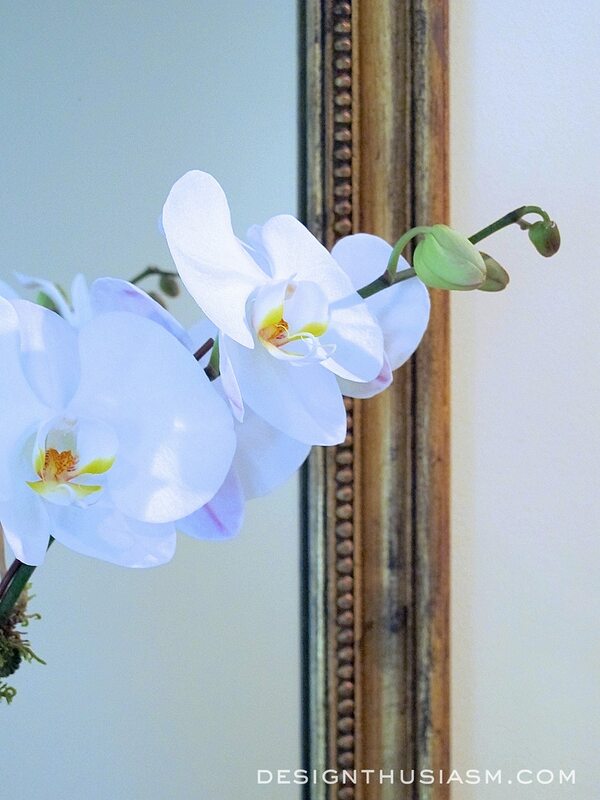 Lory, Your photographs of the orchids are just gorgeous. Thanks for sharing. Sylvia D.
I think it looks perfect for the space Lory! I love flowers, but have never had an orchid. I think they are gorgeous, but just a little too fancy for my style. Thanks for sharing with SYC. Thanks, Jann! They not too easy to take care of either… 😉 I actually generally prefer more lush flowers, but a lone orchid can also be so lovely. I just started to follow your blog and I must say you have amazing taste and style! I look forward to your posts. Thank you for sharing your beautiful home. The mirror is absolutely gorgeous as is the chest. The only thing I might tweak a bit is the pot that the orchid is in. 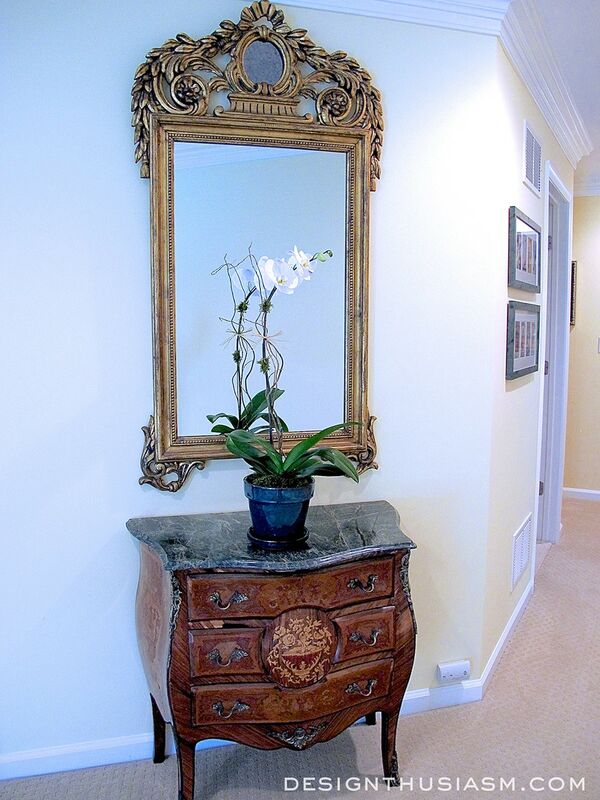 It looks a bit casual for such an elegant chest and mirror. I think a blue and white chinoiserie type planter would be perfect here. Another blogger I follow religiously is Tina from Enchanted Home. She has an online shop where she carries a multitude of beautiful blue and white pieces. Wishing you a great weekend and again thanks for sharing! 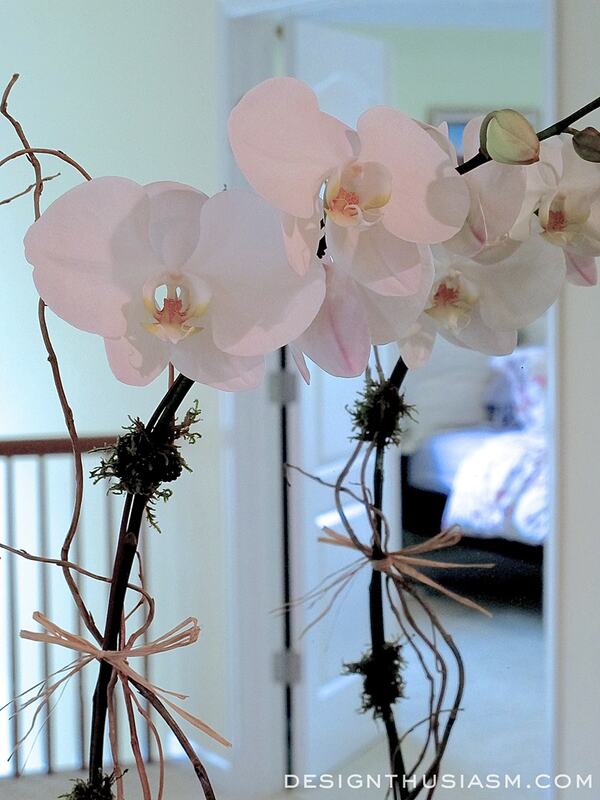 Welcome, Josie, and thanks for the kind words… 🙂 Yes, I agree, and in fact, I’m terrible with plants and the orchid had long faded… lol! I’ve done both a chinoiserie vase as well as a silver repousse there, both with white flowers. I move things around a lot! Thanks for taking the time to say hi!! I love what you’ve done so far. The chest may not be too small if you put something next to it. We don’t have a hallway in our upstairs; all our rooms come off a loft area. We had a small space next to a cabinet and placed a wing chair next to it. It looks inviting and though we don’t sit in it often, it feels very welcoming when we come upstairs. If there is enough space available, try putting a chair angled next to the chest….a Windsor chair, or a small wing chair….it gives a place to put shoes on or take them off. If it widens the space too much, you could put small framed photos in a vertical row next to the mirror to expand that focal point. I think what you have is a great starting point!